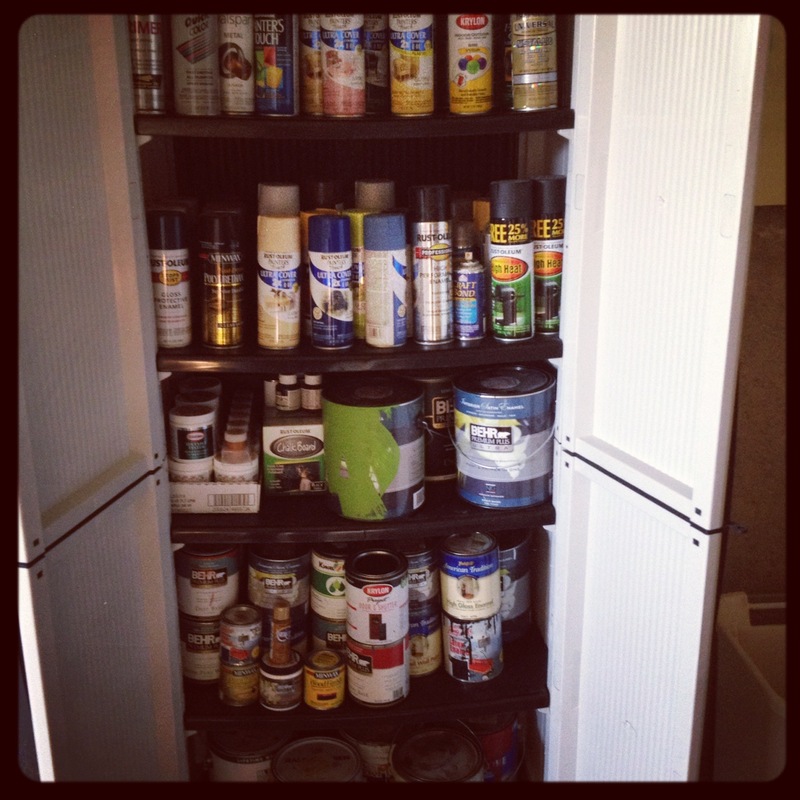 Remember a few weeks ago I shared my Instagram shot of my inherited paint collection? My friend who’s moving overseas wasn’t going to be able to ship it there and donated it all to little ol’ me. I had a pretty good stash to begin with, so now it’s just ridiculous. The very same day we picked up that cabinet o’ paint, I had picked up another thrift-gift from a family friend– this cute captain’s chair that had once belonged in the dining room of an inn in the little town I grew up in. It needed a little love, and they thought I’d appreciate the project. And um YEAH, so excited. I have a really strange obsession with chairs. I collect them, paint them, and set them all over the house. It’s a sickness. 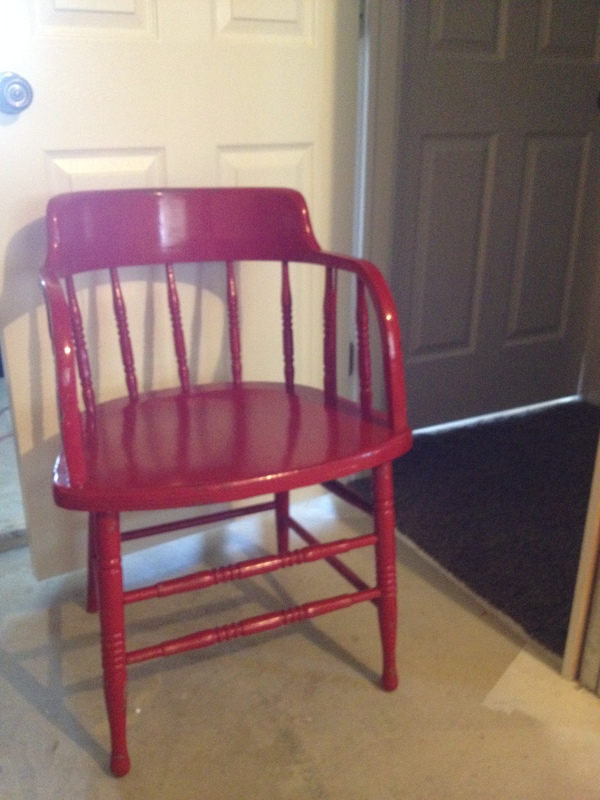 I really liked the little red chair just how it was, but it did’t fit with anything else in my house, so I raided the paint stash for a different bold shade. After a bit of sanding and some coats of primer I settled on Rustoleum Painter’s Touch in Satin Aubergine. Eggplant-colored chair in the office – lovely! And my chair affair didn’t end there. (ha!) 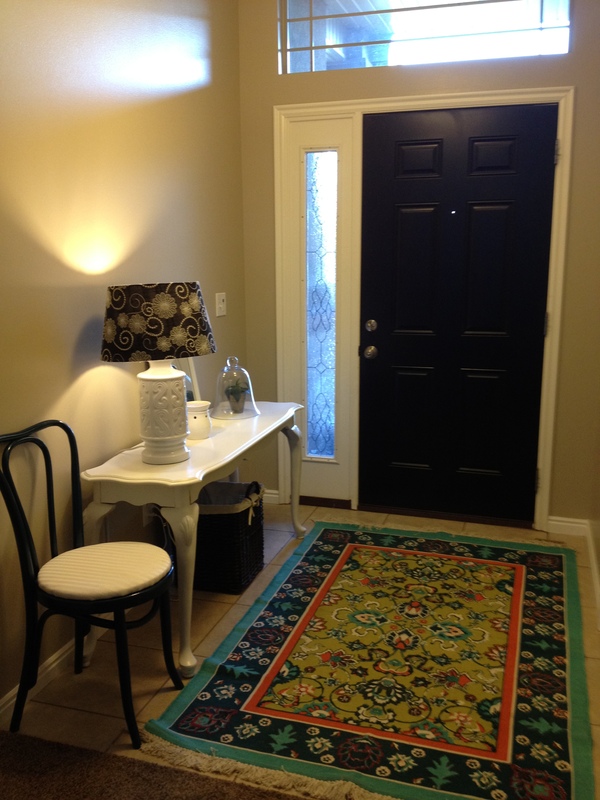 I re-re-painted two cane chairs of my grandmother’s (first redo here.) The light green was nice, but I was having fun with dramatic colors. 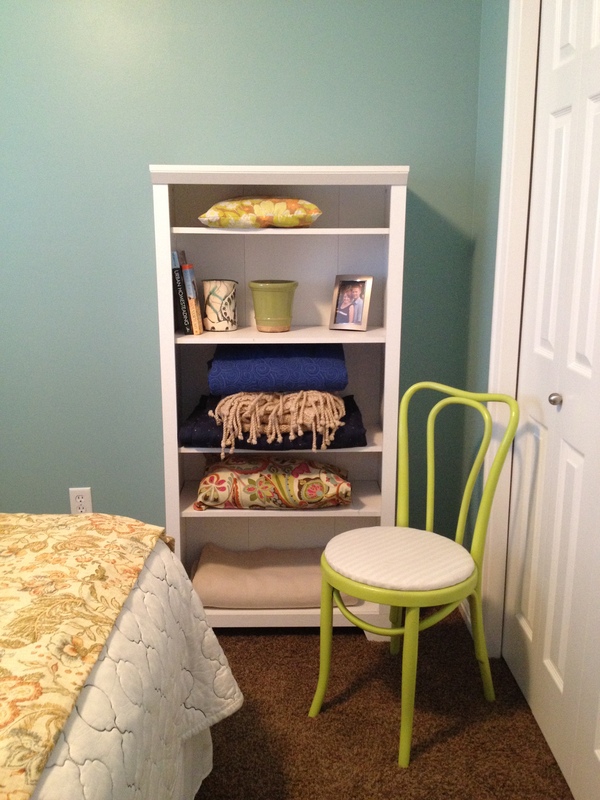 I went with one in Rustoleum Painter’s Touch in Satin Lagoon..
and one in Rustoleum Painter’s Touch in Apple Green.. 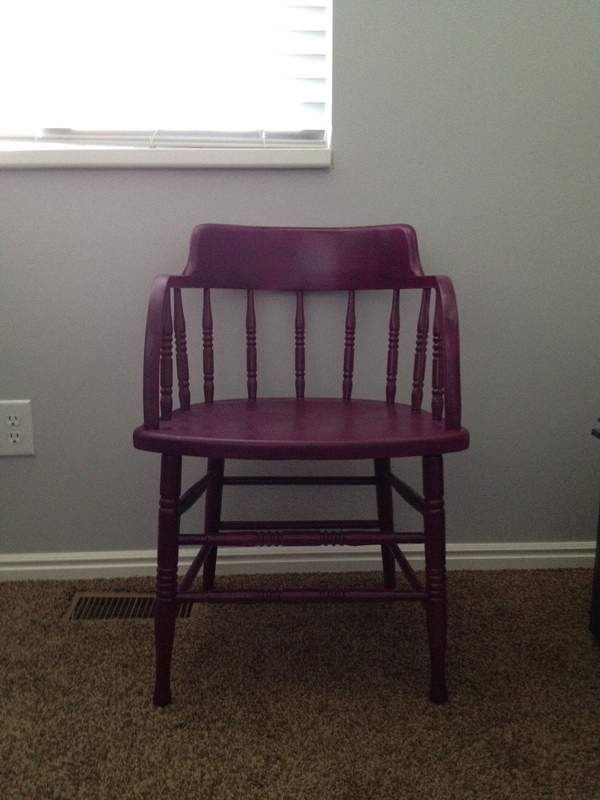 Unfortunately, the upgrade of the three cute chairs wasn’t completely free – I did have to buy one can of the eggplant-colored spray paint (the one on hand didn’t cover it). But the lot of chairs makes me pretty darn happy to look at scattered around the house so it was certainly worth the $4 or so to make them pretty accent pieces. PS: I was hoping to find something about the origin of the captain’s chair, a photo of a similar one in the inn, perhaps? 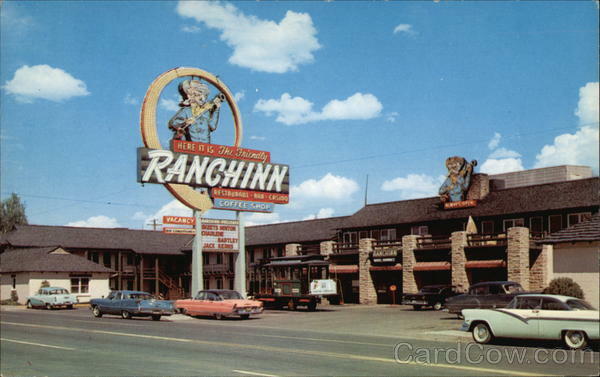 After some Googling, I was only able to find this awesome circa 1950 postcard of “The Friendly Ranch Inn” in Elko, NV. Isn’t it charming? Maybe I should start a vintage postcard collection, too..
Isn’t it so great? I love it, too.